It’s been a fairly busy couple of years for the duo known as The Pet Shop Boys. They’ve recently released a new studio album entitled ‘Yes’, a greatest hits collection and toured the world. So you’d have thought that they’d want to take a step back and take some time off. Instead, work has gone in to a collaboration with the Wroclaw Score Orchestra with the result being a soundtrack to the ballet ‘The Most Incredible Thing’, based on the story of the same name by Hans Christian Anderson. Soundtracks to pieces of work either on stage at the theatre or for film can sometime be problematic for the artists involved. Firstly, the music is created for a particular reason, be it to accompany a scene feature extreme heartbreak or it could be when chaos and uncertainty ensues. Basically, if fans of The Pet Shop Boys are expecting an album full of material that’s similar to previous releases, this might be the album for them. However, this isn’t the first time that the band has dabbled with soundtrack work. Casting our minds back to 2004, the soundtrack for the classic silent film Battleship Potemkin was scored with subsequent free gigs in London, Newcastle and across Europe. 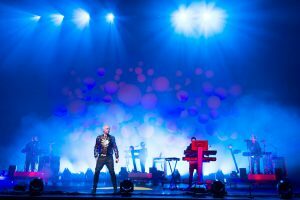 With The Pet Shop Boys always looking to create music for different projects, a ballet might seem strange, but original. Soundtrack albums can sometimes be unfair on the music buying public. Tracks often seem like fragments and clock in at roughly two minutes, not giving enough time for sounds to morph and build. And if you haven’t seen the body of work it’s accompanying, it can be hard to relate to. With this release, tracks are full bodied pieces of work with so much music, that it has to be split across two CDs. It’s strange, the music doesn’t feel like a soundtrack, almost like a brand new Pet Shop Boys album but with experimentation in the form of orchestral inclusion. Impressions may be cast that just because an orchestra is used, this will be a minimal and quite affair. Granted, there are beautiful ambient moments such as in ‘The Clock 1/2/3’ where long swirling chords echo and dance around before being beefed up with various elements including gentle chimes and piano elements. You’d expect this sort of sound as ballet is seen as an activity involving grace and posture, not thumping beats that could be played in a club. The Grind is something you’d not expect to hear in a ballet. Beats flicker in and out as guitar strum in and out, sounding something straight off a Radiohead record. This track is one of the perfect examples of how electronics and orchestral sounds can combine together and work perfectly without any messy results. Cynics might argue that it’s hard to make emotive music from laptops and complicated looking equipment full of knobs and dials, but it gives the impression that a good time is being had. In theory, this shouldn’t work as the genres of music should clash and sound disorganised, but with such professional musicians being involved, nothing has gone wrong. People might be disappointed with the lack of vocals from Neil Tennant, but you have to remember that this isn’t a Pet Shop Boys album, instead a successful collaboration that is on par with material they’ve previously released.